Jere Smith was admitted to the Georgia Bar in 1992 after attending Florida State University (B.S. 1989) and Mercer University (J.D. 1992). Jere joined Moore Ingram Johnson & Steele in 1992 and is currently a partner in the firm’s Litigation Department. His practice areas include Business and Construction Litigation. He has written and spoken on Materialman’s Lien Law for various organizations including the State Bar of Georgia Continuing Education Program. 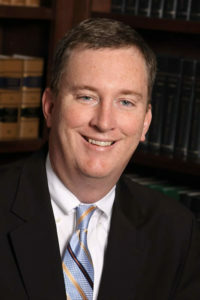 He is an active member of the Cobb County Bar Association (Young Lawyers Section) and the State Bar of Georgia. Jere is also a member of the National Association of Dealer Counsel. Jere was born in Atlanta on April 23, 1967. He and his wife, Katie, reside in Kennesaw with their daughter, Ellie and son, Charlie. Jere and his wife enjoy reading, traveling, music, golf and all sports.